Ben came to MaPaw about 2 years ago after being surrendered to a local shelter when his owner became too ill to care for him. Since day one, Ben has been a gracious guest. Ben was so happy to be out of the shelter and part of a family again. To fully understand just how special Ben is, you only have to spend five minutes with him. He is such a gentle soul who wants nothing more than to be your best bud. Recently, his foster Mom noticed that Ben had been limping and a vet appointment was quickly made. Yesterday (November 16th) we found out that Ben has bone cancer in his left front leg. Unfortunately, the prognosis for Ben is not good ~ this is an aggressive cancer. 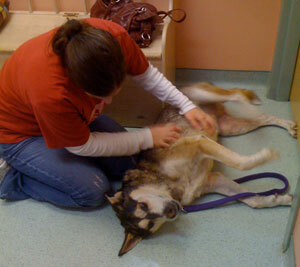 While we can not change his quantity of time left with MaPaw, we chose to improve the quality of the time we have left. This morning (November 17th), Ben underwent surgery to amputate his front leg. After consultation with the doctor, we felt this was the best option for Ben. Even in all of the extreme pain that Ben was in, he was happy for belly scratches and hugs. He is a special guy that will be spoiled for the time he has left with MaPaw. We are all heartbroken, but we are grateful for whatever time we have left to spend with Ben. Please keep Ben in your thoughts. Ben made it through surgery and was recovering nicely when we checked on him post surgery. He should be able to come home tomorrow and we can’t wait! Date of Drawing has not yet been determined.